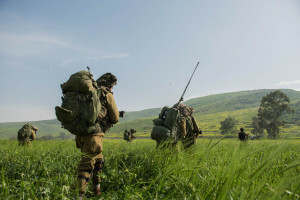 Having finished moslul (our first Kav), and the short period of exercises my battalion (Lavi) was doing in Kriyat Gat, my platoon got on a bus and went off to a base in the Jordan Valley to do one month of Kav with the special reconnaissance unit of the IDF’s tank division known as Palsar Shirion. The Jordan Valley is a beautiful place, and quiet. Very quiet. Still, the IDF keeps a constant alert on all of Israel’s borders, after all the border with Egypt was quiet for a long time too, until recent events have turned it into one of Israel’s most unstable border areas. On the Jordanian side is the risk of instability caused by terrorism from Islamic State, or dangerous elements amongst Syrian refugees dwelling inside Jordan. Most days, we didn’t have too much to do. And I was very happy to find that I was able to nap longer than anything else, almost daily. Thank God the internet was also good, or I’d have been so extremely bored. The month went by fast, because it was so pleasant. And the time long awaited had finally come, my platoon is the first to change from Battalion Lavi to another Battalion in our Kfir Brigade. Lavi, despite the fact that it is the best battalion in Kfir, is being closed due to budget cuts imposed on the military by the government. We had a dinner with the Battalion commander of Lavi, received parting items, and went on our way. 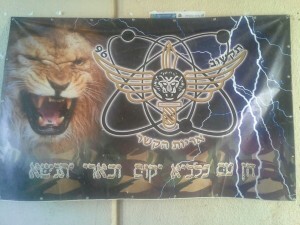 And so, my platoon is the first to splinter off from Lavi (Battalion 96) to Nachshon (Battalion 90). Why Nachshon? 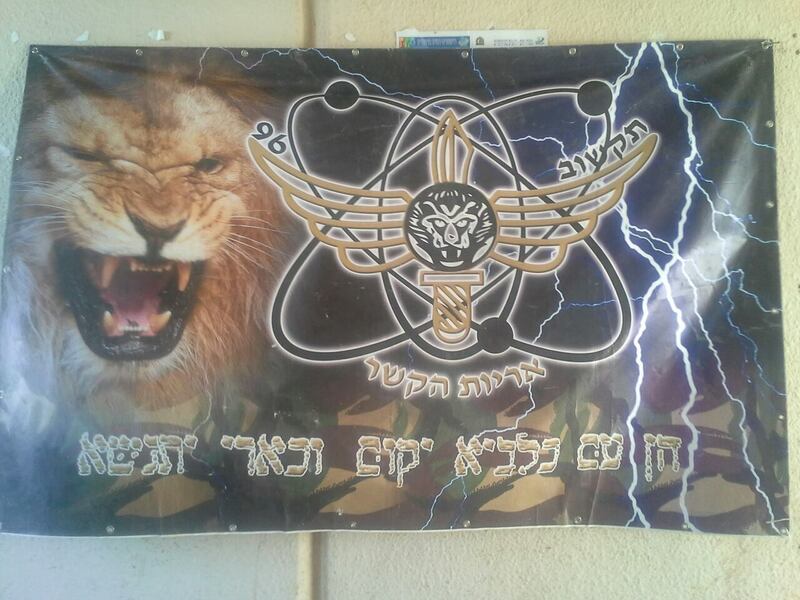 Probably because it is the oldest battalion in Kfir (unlike Lavi which is the newest) so Nachshon has the most resources saved up over time, thus allaying fears that it will also be slated for closure. I began my time as a new combat recruit in pre=training with Nachshon, that was before I was selected for Lavi, so I knew some commanders in that battalion. And when my platoon arrived at our new company in Nachshon at a base in the Golan Heights, I eventually found those commanders. As well as soldiers I knew from Michve Alon, or from my time in pre-training in Nachshon. Our new battalion has welcomed us warmly, and I see no reason why there should be any problems. My platoon has become part of Mivtzayet, which is a company meant for special operations. It literally means “operational”. Basically, things like guerilla warfare, tunnel warfare, and other special situations that require high tactical preparedness. So, yes, I’m happy. The military exercise period has given us time to integrate and get to know the people we’ve joined. This past week included a Targil Hativa, meaning a brigade wide military exercise. The entire Kfir Brigade, all six battalion. Since an entire army of people is involved, the army added to this an artillery battalion, a tank battalion, and all sorts of stuff. All in all, I’d say there were 150 different kinds of armored vehicles (tanks, APCs, etc) and 1800 combat soldiers. The drill would last a few days, and it would be led by the Kfir Brigade commander. This means, that the only people who know where we will go, what we will have to do, and what our missions will be is above that man’s own head. The Kfir brigade commander, like the rest of us, would have no idea until we reach those metaphorical bridges to cross. Aside from our combat vest, and various weapons, our war bag contained spare clothes and 9 liters of water in bottles. Another three liters of water in our “shluker” a hydration bag that is usually in our combat vest. I removed the bag attached to my vest to make it easier to carry the war bag, and attached the shluker to my back instead. This worked fine, but after a few days it sprung a leak. So that was fun. Aside from that, the war bag contained sandwiches we made for ourselves the night before we left for the exercise. 12 sandwiches a person, one for each meal if you eat three meals in a day. By the end, my bag still contained uneaten sandwiches. Amazing. The drill began with a 12 hour ride in a crowded APC. No room to get comfortable, most of the time I slept with my helmet on my head against the bud of my gun for stability. Or otherwise, leaning seated against the nearest wall of the transport. The APC would stop and start, hit bumps, every now and again I might stand up after opening the top to breathe some air and look at the world around. Helicopters. 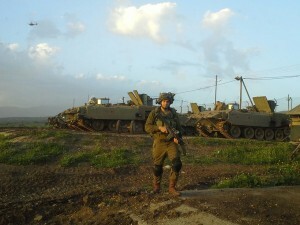 APCs, Tanks, all sorts of equipment on me and near me. But mostly, everyone just stayed hunkered inside from the cold, with the top armor closed. When we finally arrived, we got out of the APCs and hiked a few kilometers to began conquering a town in the forest. We spent the days hiking and battling, and twice entered actual Arab towns for urban warfare. The first time was around 6 in the morning, and the inhabitants seemed nice enough. It was an Arab/Druze town in the Golan Heights, a seemingly secular one. And the people didn’t show a hate in their eyes I’d gotten used to in other Arab towns in a different region of Israel. Still, their body language was one of tension. And I was not going to ignore that. While we sat around near a house, a 17-23 year old man came out offering us hot coffee in a pot. He poured it into cups and gave it to us. According to our military code, we can’t take anything even if its offered to us. However, the guys around me were very excited to share a human moment with this Arab man. So they accepted his generosity. I, however, did not want to risk being poisoned. Our Senior Sergeant felt the same, and ordered everyone to throw the cups into the trash after the young man went back into the house. school I could hear the shouts of screaming children, they sounded excited. Lines and colums of soldiers were passing their gated school yard, and boys and girls were standing pressed against the gate. Most were shouting and excited, some had their hands sticking out of the gate as if seeking to slap our hands in a greeting “give me 5” as it were. One girl stood that way, with her hand out, but was completely silent. The soldiers, again, Jewish hopefuls looking for human moments with Arabs and Muslims…people normally in conflict with us, took this chance. And most of those around me gave them “5” as it were. I did not. I’ve seen excited and shouting children before, these kids were too excited. As we turned the corner, a Bedouin soldier in our platoon caught up with us, he was furious. Seems this town wasn’t as nice as I’d thought, considering 6-8 year old children don’t learn to hate Israeli soldiers on their own. They learn it from home, from those same parents I’d passed along the streets. Those same stores, vendors, construction workers, and houses, full of people I’d seen or made contact with on the street. Still the town, like most Arab towns I’d passed, was quite nice and affluent. If people in other countries would see how Arab Israelis live, I think they’d leave this conflict alone. Life of luxury, better than I have in some ways. I remember during a few hours of down time, everyone laid down to fall asleep on a grassy hill. It was dark, and became quite cold. Some had aluminum to use to cover themselves, most of us including myself didn’t. And regardless of that, I believe every single one of us was disturbed quite a lot once it began raining. The cold drops forced everyone to wake up, and go into their war bag for rain coats we’d packed with us. For me, the rain coat was a blanket, I found it much easier to sleep with it on. When we woke up before our next mission two hours later, I’m quite sure everyone had hyperthermia. The shaking stopped once we started our movement to the next place. By the end of all the exercises, I found myself dragging my gear on my back in a big Arab city we’d spent all night hiking to reach. After fighting our urban battle between the hours of 3 and 6 in the A.M. buses were waiting for us, and after I pulled up my things onto the bus, I remember sitting down and waking up a short time later. Great blog as always, Robert. Am very touched by the story of the kids, by the words of the Bedouin soldier and how hearing those words must have felt. Thank you again for your service. Great read Robert; feels like I was there with you. Unforgettable time of your life too. Thanks for sharing. Thanks for another eye-opening look at what you soldiers experience during your service to us all. It’s always a delight to read your articles, Robert! Хорошо написал … Сочувствую тебе ,жаль помочь не могу. А дети поступают так,как их учат дома и в школе.Мы это всё знаем. Крепись , родной. Good Luck to you and your friends . Your Grand. Robert – I just read your op-ed in the April 20 Jerusalem Post. It was a beautifully and thoughtfully written piece that I expect articulates the feelings of many Lone Soldiers when they decide to make this sacrifice.